Is Rodgers Ready? ~ The Bucky Channel - The World of Sports from Wisconsin's Perspective. 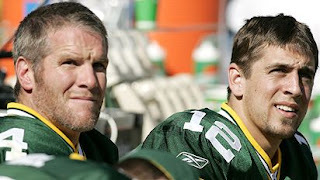 Home » Aaron Rodgers , Brett Favre , NFL » Is Rodgers Ready? As you know, if I read something I like, it's coming your way. If you check ESPN.com at all during a given day, then you've likely already seen this article, which was their top story this afternoon. If you haven't, this article that looks into the Favre/Rodgers friendship, and if he's ready to be "the guy" is a good read.